The Vintage Tyres DIY Tyre Fit Kit- Just add levers and elbow grease! 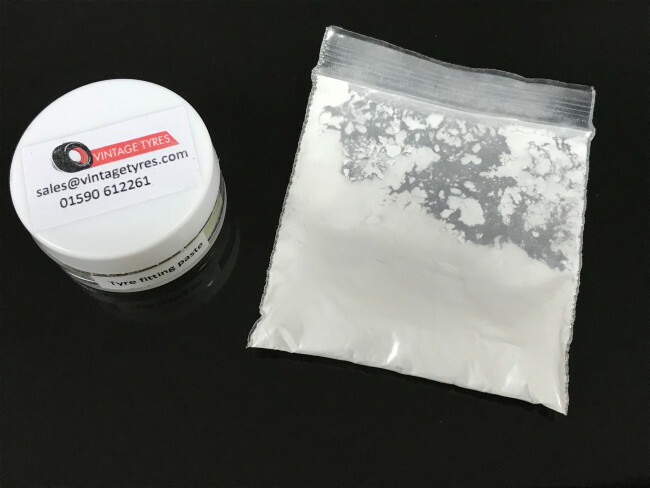 Ideal for motorcycle tyres or small beaded edge tyres. Contains: Approx. 15ml Tyre fitting soap paste and a 5g of talc for inner tubes. Directions: Using a small stiff brush; apply a thin coat of tyre fitting paste to the bead of the tyre with which will face the inside of the wheel rim, then fit the first tyre bead to the wheel. Cover the inner tube with talc, then tuck the tube inside the tyre making sure the valve lines up with the valve hole in the rim. DO NOT fold or roll the tube in! Next; apply tyre bead paste to the outer tyre bead and fit the remaining bead onto outward facing side of the wheel.